The Lessons of NY9:I mentioned this race and it’s outcome in yesterday’s Ramble , but there’s an important aspect of all this that I’ve overlooked, at least insofar as my online comments. The lesson is that there’s a number of longtime held myths that this race and it’s result blows sky high. The best way to do that is to look at what the winner in that race, Bob Turner, did during his campaign.First of all the old Tip O’Neil bromide that “all politics is local” just went out the window. Turner did not even mention local issues in his campaign. Rather, it was all national issues.Further, in that framework, and not once during his campaign, at least so far as I know, did Turner suggest he wanted to work with the Democrats and arrive at anything remotely resembling a ‘bipartisan solution’. During the campaign, Turner repeatedly… and loudly, said he would eliminate the US Department of Agriculture the EPA and reduce the size of the Department of Education. The stated aim, reducing spending at the federal level by some 35%. Turner made no secret of not wanting Amnesty for illegals.. Turner’s a Roman Catholic, and therefore is pro-life. He’s stated he supports the Defense of Marriage Act. 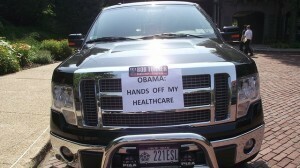 He also wants Obamacare repealed. Doesn’t much sound like the bipartisan noises we’re supposed to be making, does it? Hope and Change:(nods to Drudge) 'WAVE OF FORECLOSURES'...  BIG JUMP IN JOBLESS CLAIMS...  INFLATION RISES...  All “unexpectedly” of course. Do we really want to compromise with the Democrats… the ones who got us to this pass?